It is with great excitement that we announce our newest business relationship with Pro-Lite Sports. 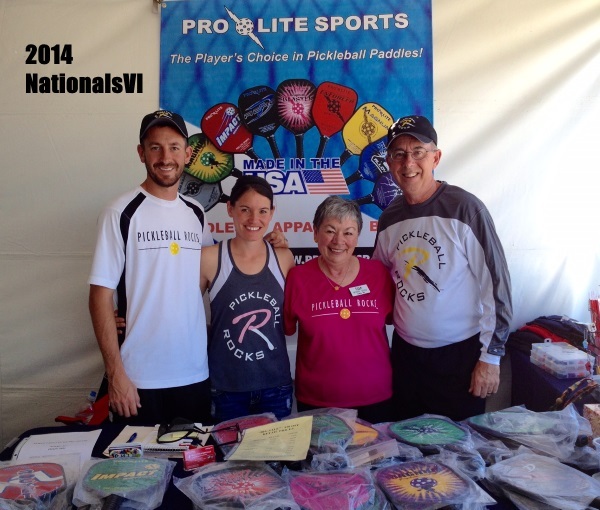 On December 12th, we signed an agreement with Pro-Lite to represent their great line of pickleball paddles at an agreed upon series of major tournaments throughout the United States. For the past 7 years we have been Pro-Lite paddle distributors in the Cincinnati / Southeast Indiana area as well as many of the east-of-the-Mississippi tournaments on our yearly schedule. This new agreement will take us to every region of the country in 2015 and we are excited. Not only will we proudly represent Pro-Lite paddles, but we will now be able to bring our fun, Pickleball Rocks apparel brand to the whole country. Dennis and Bunny Duey Pro-Lite Retirement 11-9-2014. This opportunity came about because of the November 10th retirement of long-time Pro-Lite distributors, Dennis and Bunny Duey. When Pro-Lite contacted us about possibly taking their spot, Dennis and Bunny were very kind and gracious in their sharing the pros and cons of filling their position with Pro-Lite. With all the very capable people in the country, we are very humbled that Neil and his Pro-Lite team chose us to fill these very big shoes as Pro-Lite paddle distributors for the Southwest and Western regions of the United States. We realize we have some really big shoes to fill. Not only have Dennis and Bunny been major Pro-Lite paddle distributors for years, they have been wonderful leaders in our sport for even longer. But we are excited for the opportunity as this will expand our tournament schedule from the 23 tournaments we did in 2014, to a whopping 32 tournaments for 2015. So looks like we better get the oil changed in the Tahoe and the frequent flyer club card dusted off and ready to go. Thanks Dennis and Bunny for setting the bar high, and thanks Pro-Lite Sports for passing the torch our way. 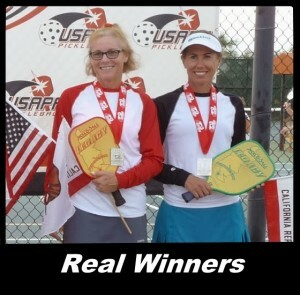 When people ask us “what is pickleball?”, we routinely send them to www.WhatIsPickleball.com where they can get a set of the rules, see some videos of people, old and young, playing plus hear Josh Grubbs give them his take on this great sport. In the very near future, we will not have to answer that question anymore because the main stream media is quickly helping us spread the word. The greatest example yet is northern Michigan’s 9and10 News, which recently did a LIVE pickleball promo segment every 15 minutes for 3 solid hours. Beginning at 6am, reporter Kalin Franks, did live player interviews and updates from the old Traverse Bay YMCA in Traverse City, Michigan. 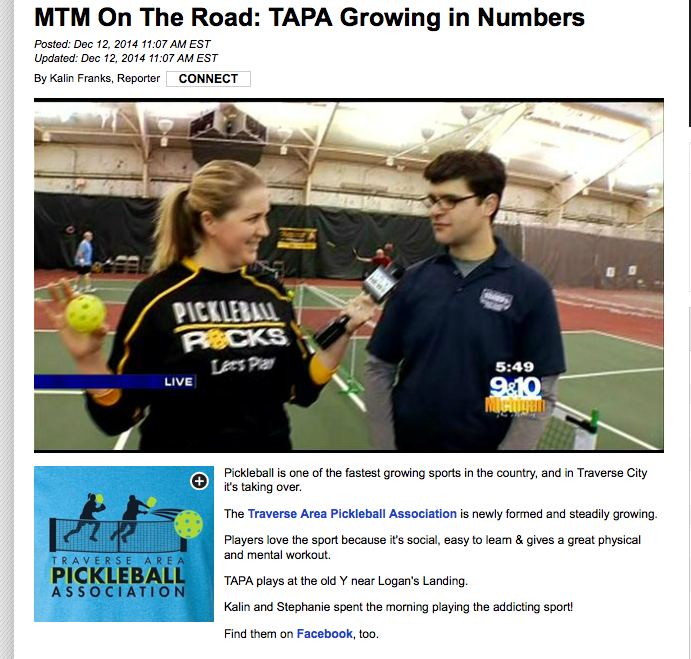 TAPA (Traverse Area Pickleball Association) has done a phenomenal job of growing pickleball in Northern Michigan and this news coverage just told the world. By the time Kalin and sidekick Stephanie finished their last segment around 9am, their tv audience was left with no doubt about how great pickleball is for individuals and for a community. Many thanks to Kalin and Stephanie and the whole 9and10 News team. 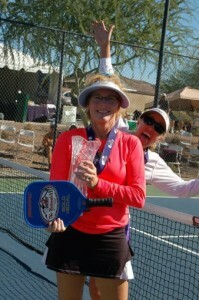 Pickleball Rocks and so do you! See all the video segments by CLICKING HERE. Great job Bart Ford, Gary Ford and all those featured players. !